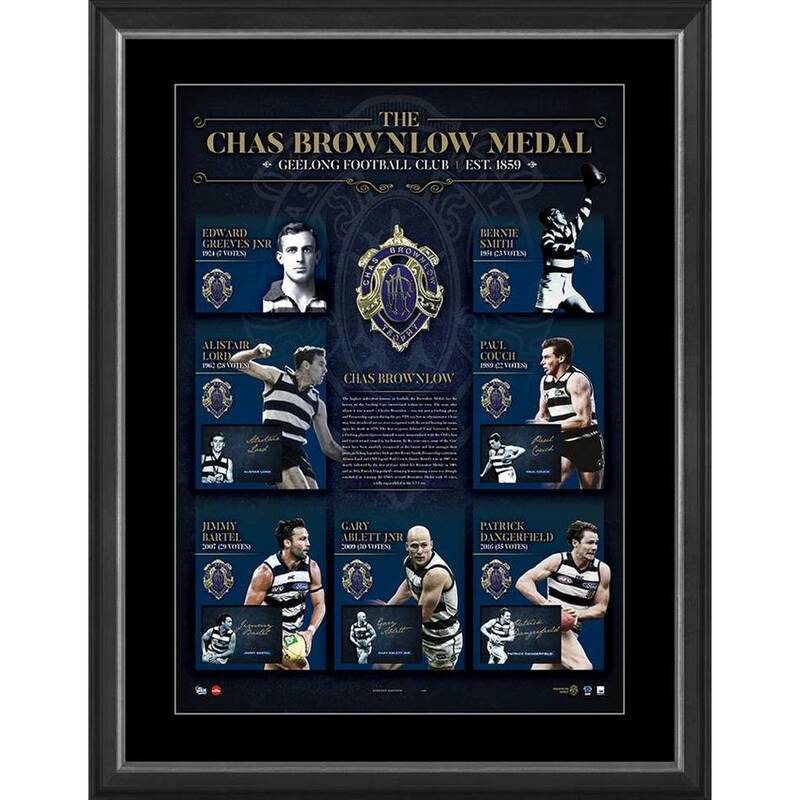 Official Memorabilia and the Geelong Cats are pleased to pay tribute to the history of the Chas Brownlow Medal and its esteemed recipients. It’s a wonderful initiative being supported by past greats of the game, with proceeds of each sale donated to the Brownlow Fund to assist former players that have fallen on hard times. This deluxe lithograph pays tribute to the Geelong Cats’ history of Chas Brownlow Medal success, and is personally signed by Geelong superstars Patrick Dangerfield, Gary Ablett Jnr, Jimmy Bartel, Alistair Lord and Paul Couch, whilst also including the facsimile signatures of Bernie Smith, Edward ‘Carji’ Greeves and Chas Brownlow – reproduced with the endorsement of their respective families. This lithograph is a must-have for Cats fans and astute collectors alike.